Most Singing Postcards go without a sleeve, but this beautiful Polish piece of art was tucked away in a weird ugly green envelop. I know that I am not a very visual person, but I would love to hear somebody explain to me the psychological background of this design. A cowboy pistol and three flowers? Do I miss a point here? 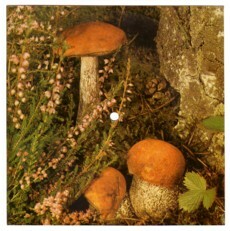 If you expect some heavy psychedelic improvisation on this mushroom record, I have to disappoint you. 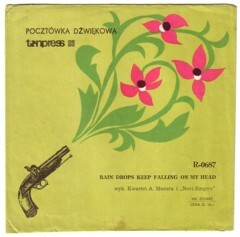 It is a version of Burt Bacharach’s Raindrops keep falling on my head , by Kwartet A. Mazura I Novi Singers. I sounds as if the record is played at a wrong speed, but it is not. Please note that after the first word (“rainbow”) the lyrics of this wonderful song have been replaced by one of the most uninspired lalala’s in the history of the recording industry. Yep, this is the stuff we live for. Hm, after listening to the song a few times, I do think that this is recorded under the influence of mushrooms. In case you really plan to listen to this song, make some coffee and sandwiches first. There seems to come no end to this misery and I don’t get the impression that any of the musicians, nor any of the other people in the studio, seem to be aware that there are some necessary ingredients missing in this recording.